Instagram is a great source of clever ideas and creative hacks for teachers. Two hashtags to follow are #teacherhacks and #classroomorganization—they’re attached to a lot of helpful, very doable ideas, like the seven here. Fighting germs in the classroom is a never-ending chore, but you’ve got plenty of help right in front of you—“many hands make light work.” Make a game of cleaning up by giving each student a wet wipe and having them scrub the tables and chairs as hard as they can. Give the one with the dirtiest wet wipe at the end of two minutes a small prize. Your classroom gets clean and the students have fun—a win-win. Tip courtesy of @elephants_and_education. Here’s another idea for keeping the classroom clean: Mount your tissue box under a shelf so that your students don’t have to handle the box get a tissue. To make this hack work, you’ll need an under-the-shelf storage basket (like this one, for example) and a pair of needle-nose pliers or wire cutters to cut a gap for the tissues. Pro tip: Shake the box well and the tissues will come out more easily. Now you just need to get the kids to actually use the tissues. Tip courtesy of @teacherovertherainbow. A lot of teachers use to-do lists to keep organized, and many of those lists include daily tasks that repeat week in, week out. 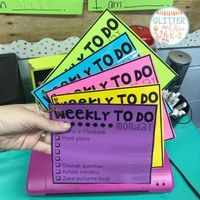 If you have these kinds of repeating tasks, consider laminating your lists—check out the image at the top of this story. You can make one list for each day of the week, for example. Include all of your repeating tasks, but also make room for any random tasks that pop up—just use a dry-erase marker to add items. Tip and step-by-step instructions courtesy of @glitterandglue4k2. These pockets are handy for organizing flash cards of all kinds—vocabulary, math facts, etc. Even better, they’re cheap and easy to assemble. You’ll need two laminating pouches for each pocket you make (one for each side of the folder). If you don’t have access to a laminator, you can use lightweight poly pockets (like these) instead. Tip courtesy of @mrsdscorner. Tap lights can help you manage the noise level in your classroom: After you’ve discussed your expectations about voice levels for different activities—silent for choice reading, for example—use the lights to remind students which level they should be using at any given time. The lights are pretty cheap: At the time of writing, you can buy a pack of four for $4 or $5. The lights can be heavy with batteries in them, so you may need to hot glue them to make them stick. You can adjust the number of lights to match the volume levels you use, and if you need more ideas to help your students get quiet, check out our article “30 Techniques to Quiet a Noisy Class.” Tip courtesy of @puttingitalltogetherin1st. To give students a quick break without leaving your room, try a game called Switch. To play, students make two lines facing each other. The teacher calls out an activity, a hobby, or anything else the students may like to do or an item they may have. If the students like or have whatever it is, they switch sides. It’s an easy, engaging way to get students moving, and they get to know each other better too. Tip courtesy of @elementarylittles. 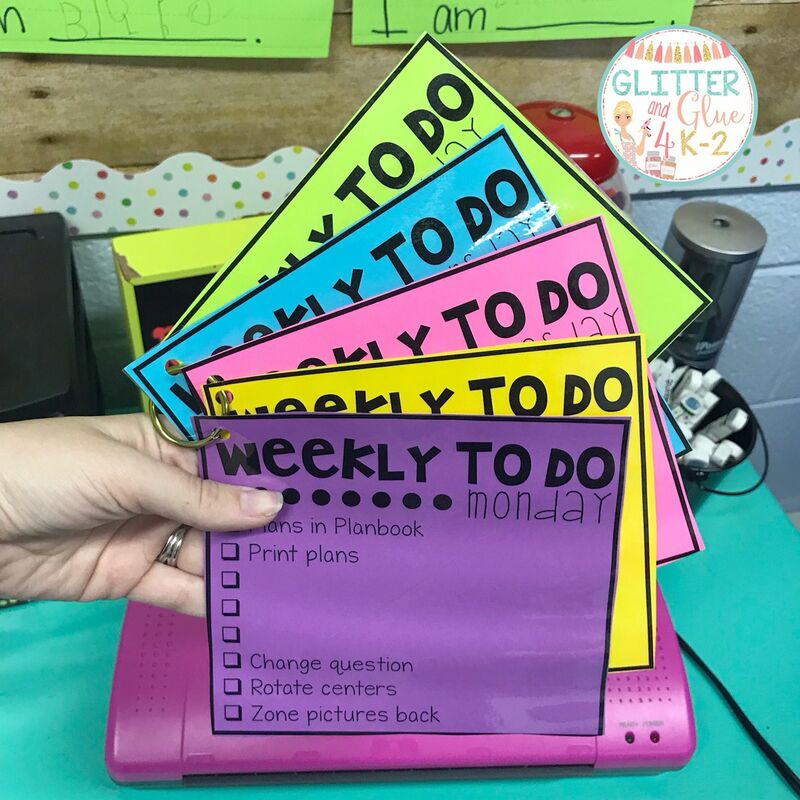 Here’s an idea built on using hanging folders to collect homework when students arrive in the morning—an idea shared by @coreinspiration. Instead of putting tags with students’ names in the clear plastic tabs at the top of the folders, attach photos of them. Using their pictures is cute, and they’ll have an easier time recognizing which folder is theirs—especially helpful in early grades or in special education settings. You may want to laminate the photos so they’ll last longer. Photo tip courtesy of @thespedwardway.